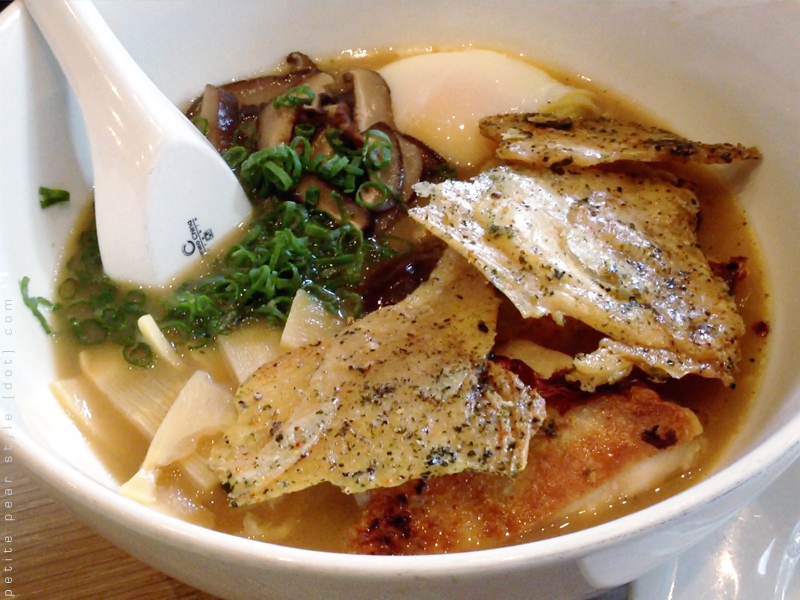 Hubs and I went to Momofuku Noodle Bar today. We stayed away for a long time due to less than stellar reviews... but we both love noodle soup and trying new eateries so we decided to finally pay it a visit ourselves. These little snacks definitely lived up to the hype. I gave one of my pork belly pieces to my hubby because I don't really like fatty meat whereas he loves it. 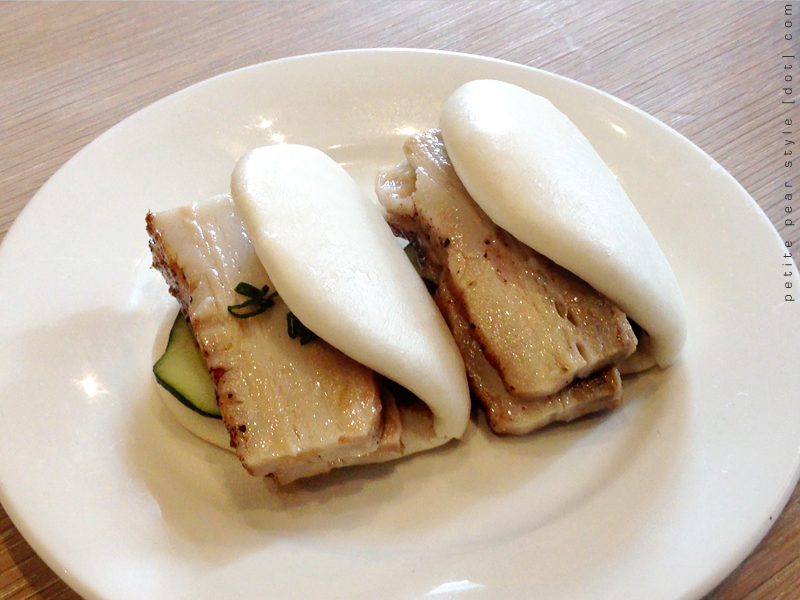 The bun with one piece of pork belly was perfect for me. It was delicious (the flavour reminded me of Peking duck) and I would re-order these in a heartbeat. 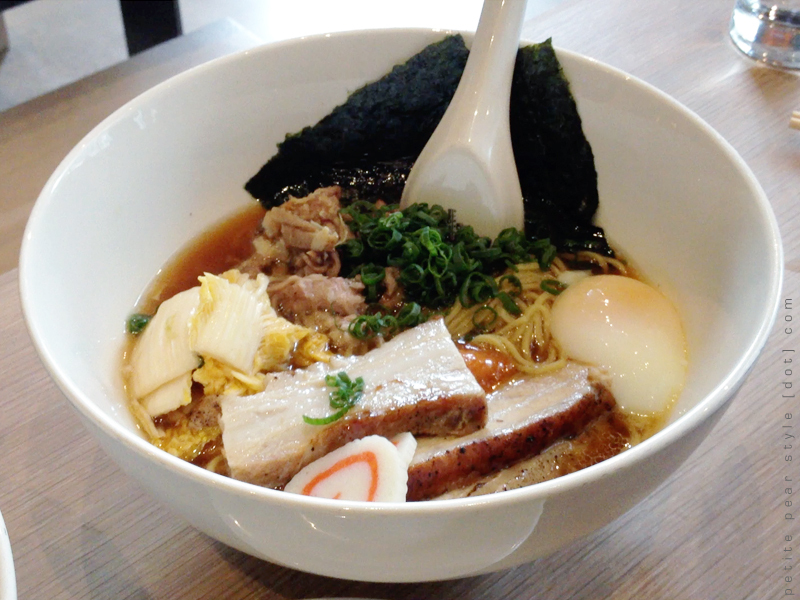 My hubby ordered the Momofuku Ramen and he was surprised by how much he liked it. There were 2 more pieces of pork belly along with some flavourful pork shoulder (I had some as I love pork shoulder). I tried a sip of the broth and thought it was decent. I'm not sure why I ordered this as I'm not a huge fan of chicken. I don't like mushrooms either and there were tons of them in my ramen bowl... the broth also had an overwhelming mushroom flavour. I usually like soft boiled egg but this one was a little too soft (I don't like it when the egg white is uber soft). My favourite part of this dish was the crispy chicken skin - there were 3 generous pieces and also 2 big pieces of smoked chicken thigh - cooked perfectly but there was no smokey flavour. I thought the actual ramen noodles themselves were pretty good but I would not order this dish again... next time, I will go with dan dan mein, which is what I would have ordered if I did not have a momentary lapse in judgement. We had read reviews about the portions being very small so we ordered a side dish to share. 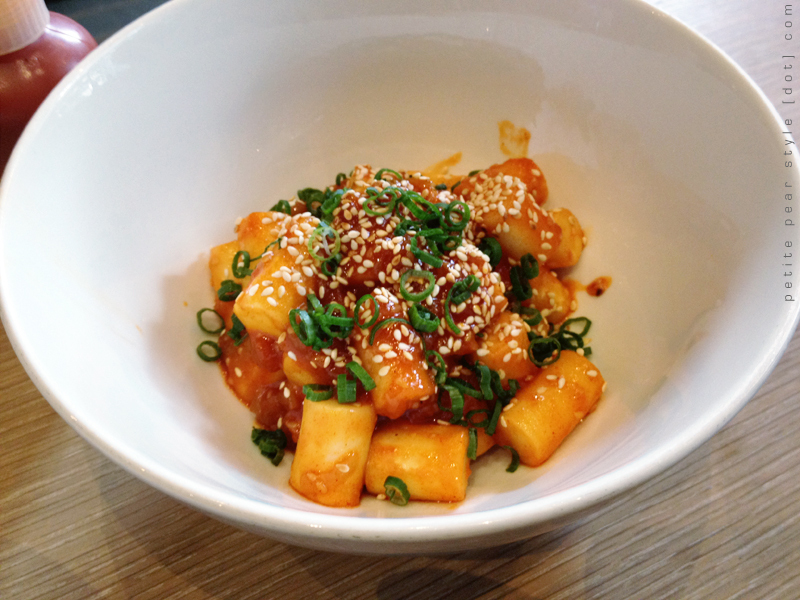 These are little pan fried rice cakes... the texture is similar to gnocchi but I find these to be lighter and less rich. This is a spicy and satisfying comfort food but we were too full to finish the entire dish. We brought these home to enjoy later. I would re-order this. 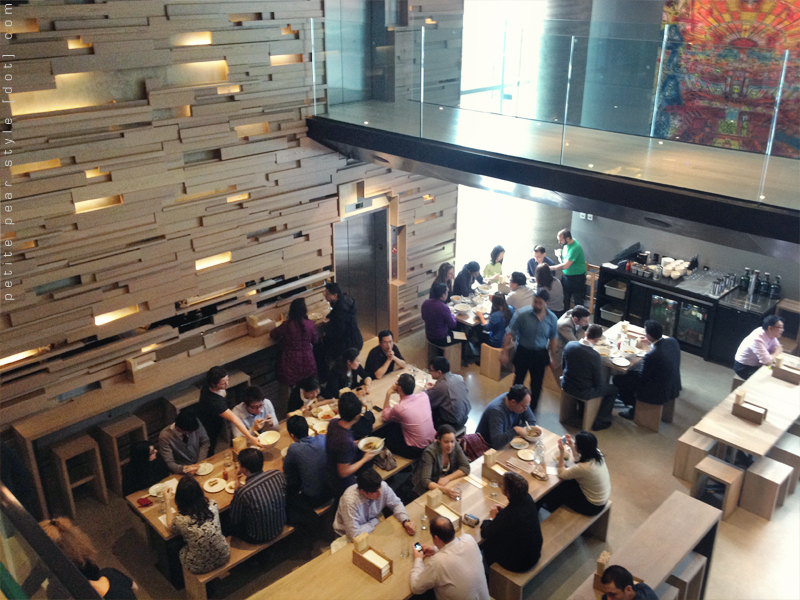 Overall, we enjoyed our lunch at Momofuku (hubs really liked it) but it was very expensive for what is essentially noodle soup. These are not huge portions but still very filling as there is a lot of meat. Our total bill (no drinks) came to around $55 not including tip. Service was good and our servers were friendly. I'd probably go back one more time to try the duck buns and the dan dan mein but I doubt this will be a regular haunt for me. I've never been to a noodle bar before... I'll have to check this place out! if you do go, please let me know what you think of the food!! The pork buns are my favorite. I just want to go there and eat steamed buns, lol! When I went, they were offering a coffee crisp panna cotta, it was simple amazing. Wow everything looks amazing...I'd love to try this place out! oooh you should come to toronto for a visit! !